As discussed on the Primal Adam article, women are known as Adam or Mankind just as men are. Therefore, the word “men” includes women. Humanity is also referred to as trees throughout scripture. From the beginning until the end, we can see the trees as symbols or allegories to learn from. In the beginning God & His Wisdom (which is personified as a female in Proverbs) created mankind in Their image: male and female united as one. Out of God came Wisdom and out of Adam came Eve. Out of the tree comes fruit, and in the fruit are the seeds of future generations. God’s Word or Holy Spirit is what plants His seed in us. Jesus (Yehoshua) went around teaching God’s “Word” to people. The doctrine that he taught was likened to seeds he was planting in people’s minds and hearts. Matthew 13:24 Another parable put he forth unto them, saying, The kingdom of heaven is likened unto a man which sowed good seed in his field: 25 But while men slept, his enemy came and sowed tares among the wheat, and went his way. 26 But when the blade was sprung up, and brought forth fruit, then appeared the tares also……. 29 But he said, Nay; lest while ye gather up the tares, ye root up also the wheat with them. 30 Let both grow together until the harvest: and in the time of harvest I will say to the reapers, Gather ye together first the tares, and bind them in bundles to burn them: but gather the wheat into my barn. Matthew 13:24 Another parable put he forth unto them, saying, The kingdom of heaven is likened unto a man which sowed good seed in his field: 25 But while men slept, his enemy came and sowed tares among the wheat, and went his way. 26 But when the blade was sprung up, and brought forth fruit, then appeared the tares also…29 But he said, Nay; lest while ye gather up the tares, ye root up also the wheat with them. 30 Let both grow together until the harvest: and in the time of harvest I will say to the reapers, Gather ye together first the tares, and bind them in bundles to burn them: but gather the wheat into my barn. So sometimes “Satan” would plant tares. There are antichrist doctrines, or false “words” taught. Satan’s “angels,” or messengers, are those people who say they’re teaching the “Word of God” but are twisting His word. You could also call the scribes who added verses and claimed they were from God in this category. These messengers of “Satan” also tend to accuse the brethren of not following God’s word, without truly judging themselves first. Satan is known as the accuser, and when they accuse others without first judging themselves they look like him, rather than YHWH. The antichrist spirit’s seed can also be described as “Satan’s Seed” or the “Serpent Seed”. 1 John 3:9 Whoever is born of God does not commit sin; for His seed (Sperma) remaineth in him: and he cannot sin, because he is born of God. 10 In this the children of God are made known, and the children of the devil: whosoever doeth not righteousness is not of God, neither he that loveth not his brother. We make known to the world what “seed” is in us by whether or not we sin. If we sin the world knows we’re a child of the “devil” or “Satan” because that antichrist spirit is the epitome of sin. If we are children of God, we become a good tree which then bears good fruit. And if we’re children of the devil, we become a corrupt tree bearing rotten fruit. Matthew 7:15 Beware of false prophets, which come to you in sheep’s clothing, but inwardly they are ravening wolves. 16 You shall know them by their fruits. Do men gather grapes of thorns, or figs of thistles? 17 Even so every good tree brings forth good fruit; but a corrupt tree brings forth evil fruit. 18 A good tree cannot bring forth evil fruit, neither can a corrupt tree bring forth good fruit. 19 Every tree that brings not forth good fruit is cut down, and cast into the fire. 20 Wherefore by their fruits ye shall know them. John 15:1 I am the true vine, and my Father is the gardener. 2 Every branch in me that bears not fruit he takes away: and every branch that bears fruit, he prunes it, that it may bring forth more fruit. 3 Now ye are clean through the word which I have spoken unto you. 4 Abide in me, and I in you. As the branch cannot bear fruit of itself, except it abide in the vine; no more can you, except you abide in me. 5 I am the vine, you are the branches: He that abides in me, and I in him, the same brings forth much fruit: for without me you can do nothing. 6 If a man abides not in me, he is cast forth as a branch, and is withered; and men gather them, and cast them into the fire, and they are burned. Note that Jesus (Yehoshua) warns of false prophets and says they’re corrupt trees and will be cast into the fire. During the sheep and goats parable, he says that the lake of fire was created for Satan and his angels. Matthew 25:41 Then he will say to those on his left, ‘Depart from me, you who are cursed, into the age-long fire prepared for the devil and his angels. He’s suggesting that those angels, or messengers are people. Just as many theologians believe the angels in the letters to the churches from Revelation to be referring to ministers, so too are Satan’s angels likely the minsters who teach false doctrines that lead to sin. Having the characteristic of sin shows who your father is because it’s a hereditary trait, symbolically speaking. You can also see the article on the only begotten son for more on how we look like our Father. When Jesus (Yehoshua) said he was the bread of life that came down out of heaven, he didn’t mean he physically came down out of heaven. Physically he was created in Mary. He was saying that now that he was eating his daily bread (from heaven) he had become it, and it had become him. He embodied the manna from heaven, just as we do when we eat our daily bread. When we do our Father’s will each day, we become the bread of life that came down out of heaven. That’s further discussed in the article on how Believers in Christ Have Descended From Heaven. When others eat of your good fruit, the good seeds are taken in by them. As you know, in one way and out the other, so in nature, once eaten by an animal, the seeds would be evacuated with “fertilizer,” which would help the growth of the seed into a brand new tree. Spiritually speaking, when people see the work you’ve done for God, they will want to partake in it too, and they may become a new tree, bearing their own good fruit and begin sowing seeds too. On the flip side, the antichrist church that teaches it’s okay to sin, is like the serpent tempting Eve to partake in its fruit. Most of us have gone down the route of leading sinful lives at some point, and perhaps passed on some bad seeds. But, anyone with the “serpent seed” can just be reborn spiritually. They can cut down the old false beliefs and attitudes and plant a new tree to bear good fruit in the future. Sometimes the parables refer to branches being thrown into the fire, and in Matthew 7 it’s whole trees being thrown into the fire. Mankind is described as branches and whole trees. In the parable of the vine, the word isn’t really “branches;” it’s just a word for “part” such as an offshoot. Jeremiah 23:5 refers to a righteous branch, but the word just means “growth” which is another way of saying an offshoot. Each person is like a tree, but they’re always an offshoot of something else, whether it’s, physically speaking, their parents, or, spiritually speaking, Christ, or the Antichrist Spirit. Even Adam & Eve were created from God & His Wisdom originally. Christ is described as “the vine” in one parable, but he’s also described as dropping God’s seed into the world (when he went about teaching God’s doctrine). He bore great fruit, dropped God’s seed, just like a tree trying to reproduce. He was a walking, talking, tree of life. He gave us God’s seed. And just like our genes have the DNA blueprints on how to build another person just like us, his spiritual “seed” had the blueprints on how to become a tree just like him. In Proverbs 8:35 God’s Wisdom (which is also the Holy Spirit, or fruit in this example) is personified as a female saying that to find her is to find life and obtain favor of YHWH. In John 17:3 Jesus (Yehoshua) says it is eternal life to know the Father. The fruit of the Father (God’s Wisdom/Doctrine/Torah/Word) has the same “DNA” of Him. When we eat the fruit, “consume” the Torah, “fulfill” the law, keep the commandments, etc., we become it, and it becomes us. We have His seed inside, we will be pure as He is pure. Then we will have everlasting life, because we will know the Father. Jesus (Yehoshua) said to know the Father is to have Him inside and be in Him. He prayed for us to be in the Father in the exact same way he was. John 17:20 Neither pray I for these alone, but for them also which shall believe on me through their word (their fruit); 21 That they all may be one; as you, Father, are in me, and I in you, that they also may be one in us: that the world may believe that thou hast sent me. 22 And the glory which thou gave me I have given them; that they may be one, just as we are one. He also taught that the way to know if you are in the Father is if you’re bringing forth His works/fruit. John 14:10 Do you not believe that I am in the Father and the Father is in me? The words I say to you, I do not speak on my own. Instead, it is the Father dwelling in me, performing His works. 11 Believe me that I am in the Father and the Father is in me— or at least believe on account of the works themselves. Just as we can tell a bad tree from a good tree by the works, and someone born of the devil or God by their works, we can tell if someone is in the Father or not by their works. Their works are the fruit that come forth from the seed inside, whether it’s sin from the devil’s seed, or whether it’s good fruit from the Father’s seed. In the book of Revelations, Jesus (Yehoshua) is described as the lamp. He’s also described as in the middle of other lamps. Revelation 1:12 Then I turned to see the voice that was speaking with me. 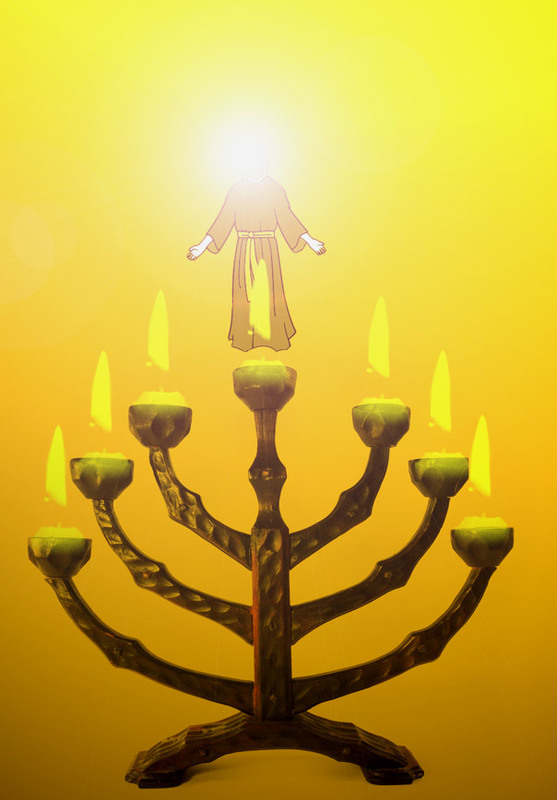 And having turned, I saw seven golden lampstands, 13 and in the middle of the lampstands was One like the Son of Man, dressed in a long robe, with a golden sash around His chest. The middle candle on a Menorah is called the Shamash. Though that was the name of a sungod, the candle (or Jesus/Yehoshua) is not worshiped as the creator. The Shamash is so named because it’s being related to the sun, because it lights up the world (and in this case the rest of the candles on the Menorah). The Shamash is lit first (like Christ was anointed), and then the Shamash lights the other candles on the Menorah, just as Christ anointed his disciples to become lights of the world. Christ is the Menorah or vine that branches off into us, the lights of the world. In the case of Revelation, the 7 candles are the 7 churches. Each church branches off into individual people, of course, just like branches on a tree. If the Menorah is seen as the tree, Christ is the water of life, or anointing oil that flows to every single branch, so long as we remain “in him,” that is keeping the Torah/Commandments then we can continue to burn brightly. When you don’t keep them, you don’t get the anointing, or water of life, and then you dry up and wither away, and have to be thrown into the lake of fire to be purified and become born again. Around the same time of year as Hanukkah, Christans now celebrate Christmas. Just as the Menorah has a light called Shamash (related to a sungod) so too does Christmas have relations with Nimrod (the sungod). I’ve been through the research on how “pagan” it is, but I’ve come to realize that the Christmas tree symbolizes the Tree of Life in the same way as the Menorah. 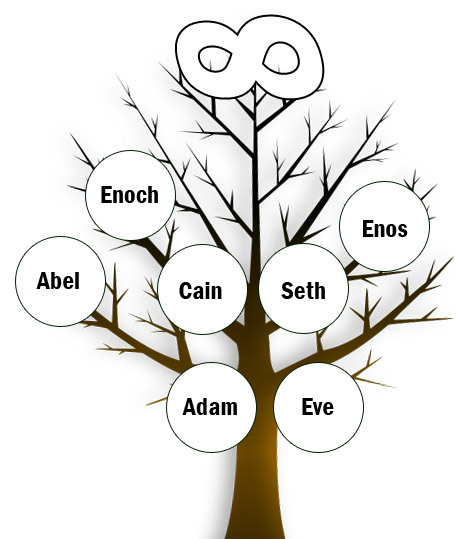 Furthermore, I’m starting to think this tree of life symbolism has always been given to people throughout the past by YHWH. What they did with that information was up to them. There is a star at the top of tree (just like the Shamash sits a little higher than the rest of the lights on the Menorah). Jesus (Yehoshua) is known as the morning star, because he’s lighting up the world. He is shining God’s light into the world, just as the morning star announced the sun as discussed on the page about Lucifer. We are told to shine brightly as stars also. The word could actually refer to the sun, but it’s translated as stars and lights most of the time in this verse. Jesus’s face shone light, brightly, like the sun, and we are supposed to be the image of God just as he was. The same spirit or light that was in him is in us. Moses was also described as having rays coming from him when his face was brightened up with the glory of God. So there’s a star on top of the tree to represent him, and lights all over the branches to represent all the churches and followers. The ornaments can represent the spiritual fruit those lights or branches are bringing forth. I know that many in the Hebrew Roots Movement (HRM) are against the Christmas tree, and many are also against Hanukah. My personal thoughts have evolved the more I study and the less I fear God in the way they do. You can see the article on what the fear of YHWH is to see why I don’t worry about upsetting Him anymore. Personally, I think YHWH gave us life and death, but not in the sense that someone in the HRM might say. They might say the choice is to celebrate His feasts only (life) or celebrate pagan feasts (death). Now I see Hanukah and Christmas as a way for YHWH to reach people in each religion, and give them the choice between life (the true meaning of the holidays – TREE OF LIFE message) or death (celebrating the holiday with greed and fear of of how to pay for gifts you feel you need to buy – SLAVERY message). The tree was an evergreen or palm tree to symbolize it being eternal. It’s circular form also represents that eternal nature. The lights are lightening up the world when the sun is not shining as brightly. When Jesus (Yehoshua) is not here teaching us physically, he really is teaching us spiritually, because he’s teaching the world through us, the ones he anointed to shine the same light he shone when he was around. The fruit is God’s teachings and work He’s doing through us. Only when the world seems darkest, can we see how beneficial it is to have us as lights in the world. It’s said that the triangular shape represents the trinity. We have many articles exposing the trinity because Jesus (Yehoshua) never claimed to be YHWH. But, God & His Wisdom created the Primal Adam and we are the only begotten son, the Primal Adam. That tree is who we are. We’re branches of him. You can call it the body of Adam or the body of Christ. But we’re all branches of that tree. There’s a reason the “pagans” believed in a trinity. When we look at who named them “pagans” I’m reminded about the Salem witch trials. Who named them witches? I’ve been called a witch by a mainstream Christian for saying Jesus (Yehoshua) wasn’t YHWH when he said himself the only true God was YHWH and said it was His doctrine he taught, not his own doctrine. The winners write history, that’s why the men who killed, sacrificed animals, and wanted an eye for an eye justice wrote much of the Tanakh (OT). Jesus (Yehoshua) told us to beware those scribes and think for ourselves, being guided by the Spirit inside. So, if the winners write history and labeled those holistic healers as witches, perhaps the same thing happened with the history of the the Christmas and Hanukah rituals. Christians don’t expect their trees to talk, and Jews don’t expect their Menorahs to walk. They see them as symbolic. But those in the Hebrew Roots community are often “afraid” of going to a Christmas party so as not to offend YHWH. Is that a fear of YHWH or a fear of trees and so-called “pagan” rituals? If that’s a fear of trees, as I discussed on the article about the Fear of YHWH, doesn’t that make them actually worshiping idols (by fearing them)? I don’t know. I’m not going to judge either side. But in my studies on the law of attraction I’ve learned that how we see things is more of a reflection of who we are inside, and we can see things as good or bad. I choose to see the good that is flowing through Christians, and Jews, and so-called pagans and New Agers.